I managed to attract many a sleaze bucket back in the day. But Kevin? He was a gentleman from the very beginning with a charming swagger and hunger for life that I just couldn’t not fall in love with. We courted. Like, really courted. For months. I got flowers, real dates – tickets to shows, fancy dinners and trips to the mountains, spa days even. One of my favorite memories of our first few months together were the Sunday breakfasts we had. He’d come over to my house bright and early Sunday morning with a bag of fresh fruit, two extra large coffees (back then I was a heavy smoker and coffee drinker, couldn’t get started without it) and a hungry belly. He’d sit at my kitchen table chatting away with me while I made us pancakes. Always pancakes. He had 3, I had 2. He had loads of maple syrup on his, I had almond butter and jam. I wrote the recipe on a little sticky note that very first day that he came over for breakfast all those 5 years ago and stuck it to the inside of the pantry door. Since then, the sticky note has traveled with us from our condo in downtown Calgary, to the home we built out of the city, to the little duplex we now call home in Montreal. Still stuck to the inside of the pantry door, still followed every Sunday, still 5 pancakes, maple syrup, almond butter and jam. This is that recipe… I hope you enjoy it as much as we have over the years! To view, print or text this recipe, click here. 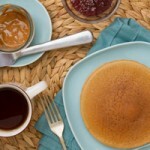 A 5 ingredient grain-free pancake recipe with a crazy amount of protein and fiber and 0 sugars or sweeteners. Place a small non-stick frying pan on the stove and set stove top to medium-high heat. Add flour, cinnamon and baking powder to a medium-sized bowl and whisk with a fork to break up the clumps. Add water, eggs and vanilla. Whisk to combine. Allow to sit for 2 minutes. 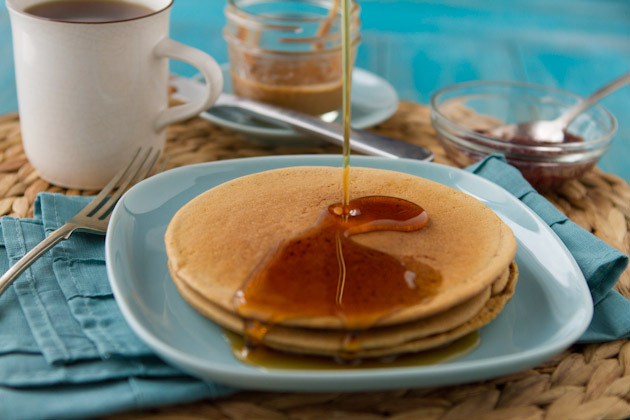 Drop ¼ cup of the batter (if using crepe-like water measurement) or ⅓ cup of the batter (if using thicker pancake water measurement) into the preheated pan. Allow to cook until bubbles form, about 2 minutes. Reduce heat to medium, flip, and cook for 5 minutes. Remove pancake from the pan and return the pan back to the burner. Crank heat back up to medium-high, wait 30 seconds, then add another round of batter. Repeat until all pancakes are complete. 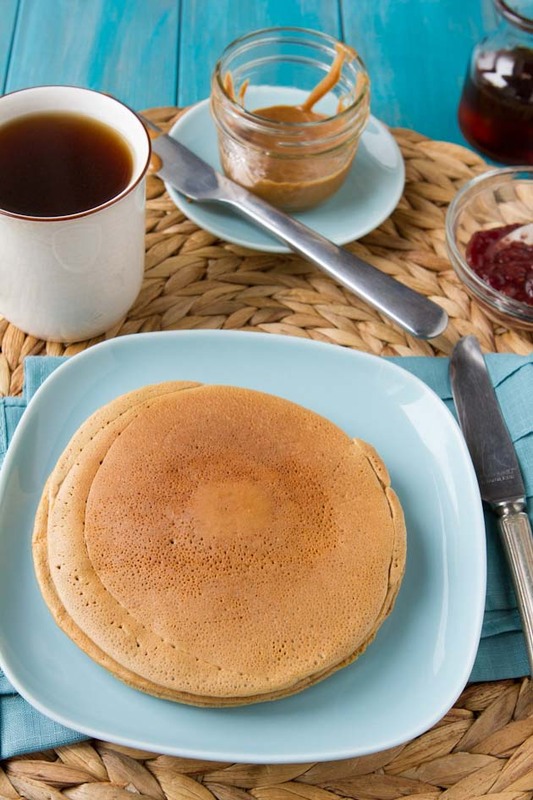 I have tried to make these vegan before by adding 2 flax eggs - 2 tablespoons of freshly ground flax seed with 6 tablespoons of warm water, allowed to sit for 5 minutes. It worked out okay when using the ½ cup water measurement, but using eggs yields a better result. I use a gluten-free baking powder (linked in the recipe) that requires DOUBLE the amount than what you would use if you were baking with regular baking powder. Be sure to adjust recipe if you're not using Ener-G gluten-free baking powder. 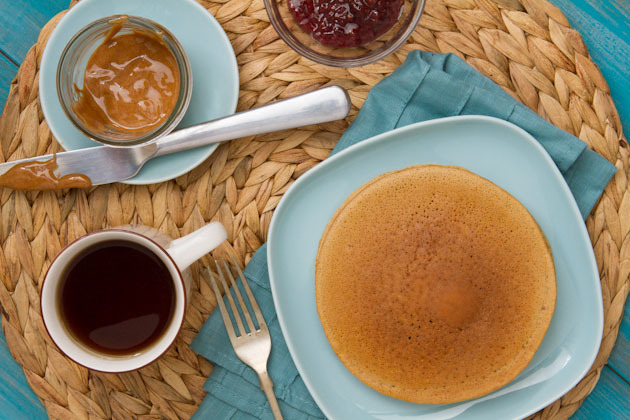 You can make these pancakes ahead of time, cool and place in the freezer. When ready to eat, just add them to the toaster for 1 minute or so (on low heat) and you're good to go! This is what the top of the pancake should look like before you flip it, and then this is what it should look like after it’s flipped. If you oil the pan slightly, there will be bubbles on the top of the pancake, as you see below. If you do not oil the pan, there will be no bubbles (as you see with the main pictures of the recipe). 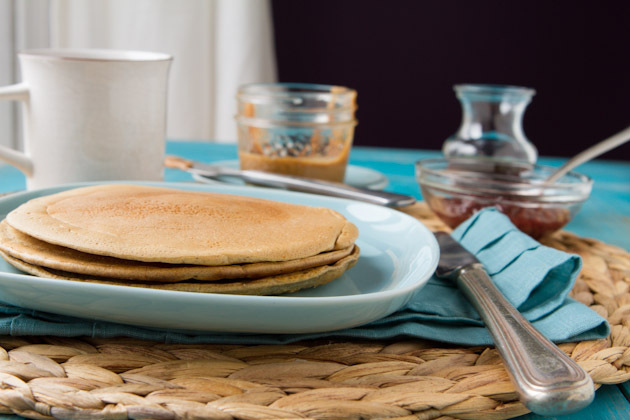 The reason I made this recipe with 0 sugars, sweeteners or unrefined sugars was so that Kevin and I could add our own flavors on top of our personal stack of pancakes. 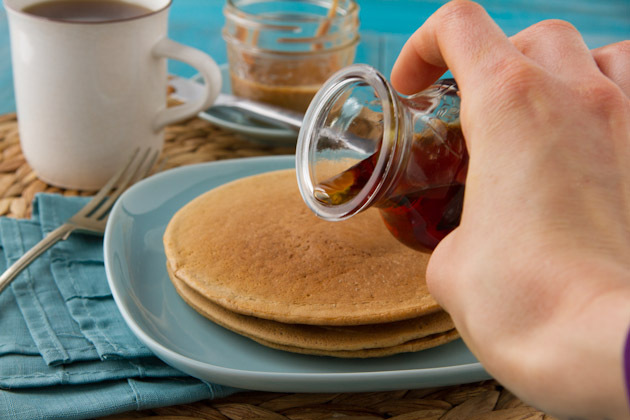 Often times we pour sugar on top of pancakes anyways – in the form of maple syrup, jams, butters, that I figured the sugar in the actual pancake wouldn’t be missed at all. If you’re following a sugar-free diet, these babies are great with melted coconut butter and coconut oil on top. The coconut adds a lot of natural sweetness! Or you could just add a bunch of maple syrup… as Kevin does. What’s the craziest date you’ve ever been on? It can be crazy good, crazy bad, crazy romantic… whatever! Breakfast in bed – do you dig it?